J-Features: Top 6 advance to the corresponding I-Feature. Bryan Hulbert - TULSA, Okla. (January 18, 2019) Wheeling his NOS Energy Drink No. 4a to the pole of Friday's Vacuworx Qualifying Night, Justin Grant set a feverish pace for 25 non-stop laps to garner his third career preliminary night win in as many years at the Lucas Oil Chili Bowl Nationals presented by General Tire. Bryan Hulbert - TULSA, Okla. (January 17, 2019) Surviving a myriad of cautions in Thursday John Christner Trucking Qualifying Night, along with a late race challenge from Shane Golobic and C.J. 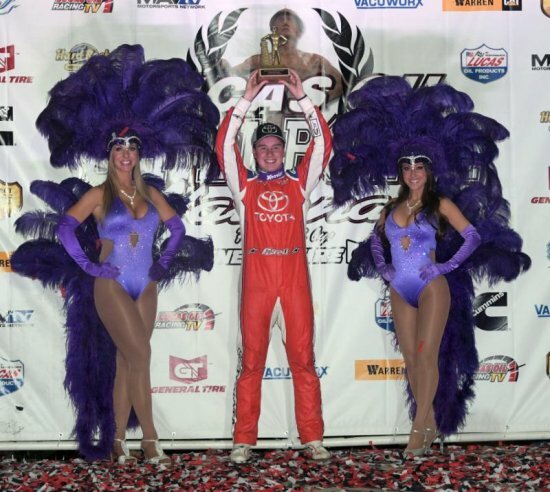 Leary, two-time defending Lucas Oil Chili Bowl Nationals presented by General Tire Champion, Christopher Bell locked his iRacing No. 71w into his seventh Saturday A-Feature in as many years. Bell's fifth career Preliminary Night win, the final four laps turned into a shootout between the Oklahoma native, Shane Golobic, and C.J. Leary. Taking his Keith Kunz Motorsports mount on two wheels on the final restart, the misstep was enough to allow the Elk Grove Ford No. 17c a run to the inside line going into the third and fourth turn. Sliding across Bell's nose, Christopher turned down the track to retake the point. For continued updates on the Lucas Oil Chili Bowl Nationals presented by General Tire, fans can follow along on Facebook, Twitter, and Instagram with @CBNationals. All official press, updates, and results on the Lucas Oil Chili Bowl Nationals presented by General Tire can be found online at www.chilibowl.com. Bryan Hulbert - TULSA, Okla. (January 15, 2019) Winning in preliminary night competition for the fifth time at the Lucas Oil Chili Bowl Nationals presented by General Tire, California's Kyle Larson grabbed the lead on Lap 6 of Tuesday's Warren CAT Qualifying Night A-Feature then went unchallenged to punch his ticket into his eighth 55 Lap championship event. For continued updates on the Lucas Oil Chili Bowl Nationals presented by General Tire, fans can follow along on Facebook, Twitter, and Instagram with @CBNationals. All official press, updates, and results on the Lucas Oil Chili Bowl Nationals presented by General Tire can be found online www.chilibowl.com. (Bryan Hulbert - TULSA, Okla. (January 5, 2019) Seven Golden Drillers claimed, and six by first-time winners, the 34th Lucas Oil Tulsa Shootout wrapped up Saturday night with California's Ben Worth leading the charge of first-time winners with his victory in the night's 55-lap Outlaw A-Feature. Chasing Frank Flud the first five laps, the Driven Midwest No. 81 suddenly stalled with Worth banking off Flud's right rear and nearly sailing into the fence. Able to save his No. 10J from disaster, Dylan Kadous was the driver giving chase with the Kansas racer's night ending on Lap 25 to advance Jake Hagopian into the runner-up spot. Able to build his lead to over two-seconds, slower traffic would begin changing the story line as Worth found himself boxed in with Jake Hagopian and Brady Bacon now closing in. Closing rapidly as the race worked past the 40th lap, a misstep on the cushion in traffic put Jake Hagopian to the point, but just as easily as traffic can give, it will take away as the caution light came on before the field could complete the lap; putting Ben Worth back to the point on the restart. Rolling a do or die slide job on the restart, the move would prove fatal to Hagopian's chances as the No. 14D went sideways into the infield with Brady Bacon and Joe B. Miller racing by. Not able to make up ground on the No. 10J, Ben Worth crossed the finish line 0.913 seconds ahead of Bacon. Third went to Joe B. Miller with K.J. Show fourth. Charging ahead 13 positions, Zeb Wise made up the top five. Taking the lead from the pole, Indiana's Zeb Wise was the class of the field in Outlaw Non-Wing competition. Chased by Russ Dissinger, a nearly three-second advantage was cut down quickly as Wise worked into traffic with seven laps to go. Railing the cushion, the challenge for the lead was a corner away, but a car into the wall among the leaders brought the caution lights on with five laps to run. With the green displayed, Wise was able to run away as Dissinger held off the charge of Kyle Spence and Brady Bacon with Hank Davis rounding out the top five. The second driver from Delaware to every top the Lucas Oil Tulsa Shootout, Kyle Spence capitalized on a bobble by Jonathan Beason on the seventh revolution of the Stock Non-Wing feature as the pair raced off the fourth turn. Keeping the field at bay until the final five laps, slower traffic entered the equation with Spence and Beason exchanging the lead several times with Jonathan threading his BA Lawn and Garden No. 36 through slower cars. Turning off the cushion with the checkered flag in sight, Beason would come up shy by 0.018 seconds as Kyle Spence grabbed the win. Beason in second was trailed by Chris Cochran with Chase Cabre and Gage Robb to complete the top five. Taking the lead in A-Class from the front row, Oklahoma's Trey Robb kept pace on the field until Lap 19. Utilizing a mid-race restart, Hyper Racing shoe, James Morris, heaved his No. 81d upon the cushion to keep pace with Robb's No. 12G. Letting his momentum get right for the move, Morris pulled the trigger on the slide on Lap 19. Diving the bottom of the third turn, the move was answered swiftly, but through the next set of turns, Robb was not able to return the favor as Morris raced into the lead. Caution with two laps to run, the No. 81d of Morris was unchallenged for the win while the race for second saw Jake Hagopian charge from fifth. Garrett Hulsey followed Hagopian's form to score third with Gage Robb rolling to fourth from 17th to relegate Trey Robb to a fifth-place finish. The results of the A-Class finish are unofficial pending the results of a tire test. With a firm grasp on the lead, Garrett Benson looked to be on his way to victory in the Junior Sprints, but on Lap 17, that all changed as the No. 2B went spinning in turn-one after contact from a lapped car. Putting the lead in the hands of 13th starting, Colby Sokol, the No. 25b was stalked by California's Austin Wood. Patiently around the bottom, the final lap was anything but as Wood put the pressure to the No. 25B, taking the win off the final turn by 0.315 seconds. Colby Sokol settled for second with Jett Barnes third after starting 10th. Baron Silva and Jack Thomas made the top five. Another instance of the lead well in hand, California's Ryan Rocha saw his night end with a violent hit on Lap 7 in Restricted competition after a slower car bounced off the front straightaway wall. With both drivers involved unharmed, the race resumed with Oklahoma's Shawn Mahaffey on the point. Unchallenged the rest of the race, the No. Mahaffey's lead was nice as the checkered flag dropped. Racing side by side for the last half of the race, Ryan Timms bested Chase Hyland for the second podium step. Jake Avedisian and Xavier Doney made up the top five. The first event at the Lucas Oil Tulsa Shootout for the Xcel 600cc Modifieds, a bump and run move by Blake Hahn on Lap 10 was the one that delivered the Oklahoma shoe his eighth career Golden Driller. Going door-to-door with the No. 127 of Korey Inglin through turns three and four for the pass, the New Jersey racer tried a couple for the lead with no success. Through several cautions, and a red flag for fence repair, Hahn would grab the win over AMA Hall of Fame Rider, Ronnie Jones, who debuted in the Xcel Modified division. Aaron Bowes from seventh came up to third with Chad Dugan fourth. A rough start to the weekend for Ty Hulsey, driver of the No. 4G the best of things with a run from 13th to fifth. The 2019 event saw a total of 275 races contested among seven divisions with 1,159 entries drawing in. Dates for the 35th Lucas Oil Tulsa Shootout are January 1, 2020, through January 4, 2020. Information about move-in dates, registration, and more will be announced throughout the coming year as the event draws near. Up next at the Tulsa Expo Raceway will be the 33rd Lucas Oil Chili Bowl Nationals presented by General Tire. The center of the Midget Racing world will come to life January 14-19, 2019 inside the River Spirit Expo Center. Reserved Seats for January 14 and 15 are on sale by calling (918) 838-3777 or can be purchased at the event. General Admission seating is included with all Pit Passes. More information can be found at www.chilibowl.com. The Lucas Oil Tulsa Shootout takes place at the Tulsa Expo Raceway, located inside the River Spirit Expo Center in Tulsa, Okla. All official rules, event information, and dates are online at http://www.tulsashootout.com. Get updates on Facebook as well as Twitter (@TulsaShootout). ***No, 1G DQ'd for being light at the scales. ***No. 93M of Riggs-Carr DQ'd for running illegal fuel. ***No. 57, DQ'd for skipping fuel tech. Heat 6 (Race 48) (8 Laps): 1. 880-Kameron Morral, ; 2. 28B-Ace McCarthy, ; 3. 4B-Ben McFarland, ; 4. 33T-Ty Nevins, ; 5. 121-Cody Carter, ; 6. 38M-Tommy Phipps Jr., ; 7. 33W-Rece Wommack, ; 8. 4K-Kodi Sunley, ; (DQ) 83-Karsyn Elledge, ***No. 83 DQ'd for being light at the scales. ***No. 14 DQ'd for being light at the scales. All cars to 5 Qualifying Races (10-12 cars each) with a four-car inversion in effect for each Qualifying Race. Like number of qualifying races with inversion of four with passing points once again. Bryan Hulbert - SAPULPA, Okla. (October 28, 2018) Adding a cherry to the top of his third consecutive championship, Sam Hafertepe, Jr. rode out of the John Christner Trucking Fall Fling with an extra $4,000 and his seventh victory over a stout field of 61 drivers at Creek County Speedway with the Lucas Oil American Sprint Car Series presented by Sawblade.com. "There is nothing like racing your best friend for 40 laps. That was probably one of the funnest races I've driven in my entire life. Me and Sean have been friends for a long time and for us to race like that and have our friendship last like it has, it means a lot, then to win this deal and show everybody who deserves this championship. That's what we set out to do tonight," commented an emotional Sam Hafertepe, Jr.
With the No. 22 holding the lead on the restart, Hafertepe's next attempt at the point came while working Lap 2, only to have his slide job negated by another caution. Pressuring McClelland on the restart, the Townline Variety No. 15h was not able to get the run as Sean slowly pulled away with traffic coming into play as the field worked past the tenth lap. Allowing Hafertepe to pull back in on McClelland, the No. 22 did not falter on the low line; using slower cars as picks to protect any run to the outside. Holding off Seth Bergman on the final lap, Sean McClelland crossed second for his ninth career podium finish with the Lucas Oil American Sprint Car Series presented by Sawblade.com. Bergman third was followed by Jason Martin with Kyle Bellm making up the top five. Charging out of the first B-Feature, El Paso's John Carney II raced through the field to sixth after starting 20th. Wayne Johnson in seventh had Blake Hahn recover from his caution to finish eight. Skylar Gee advanced six spots to ninth with roger Crockett tenth. On top of Hafertepe claiming the championship, other awards on the night included Alex Sewell who secured the 2018 title for the American Bank of Oklahoma ASCS Red River Region presented by Smiley's Racing Products. The 2018 Brodix National Rookie of the Year went to Scott Bogucki. This marks the first time an Australian driver has won the National Rookie of the Year. The Lucas Oil American Sprint Car Series presented by Sawblade.com thanks the teams, drivers, tracks, sponsors, and above all the fans for your support in 2018. Updates on the coming season can be found online at http://www.ascsracing.com. Creek County Speedway - Sapulpa, Okla.